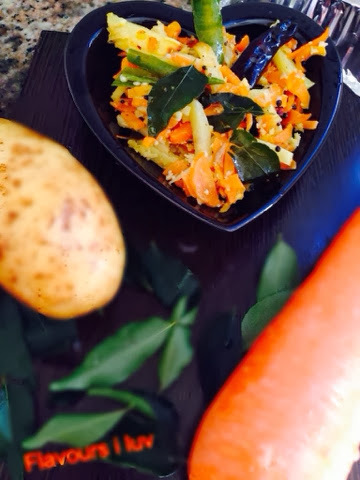 This is one of my favorite recipe, a super hit in my family. I bet everyone will like this. 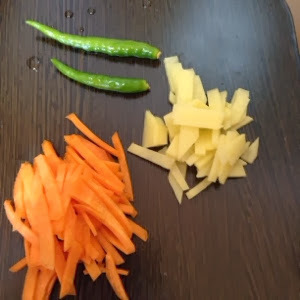 Cut potato and carrot in lengthwise very thinly. In a pan heat oil, then splutter mustard seeds. 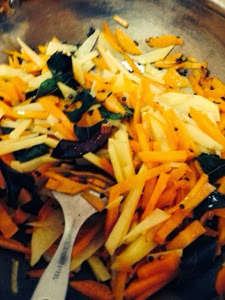 Add curry leaves into it, after that add potato and carrot followed by turmeric powder and green chillies. Close the lid and cook in low flame. After 5 minutes add ginger garlic paste and salt, mix well and cover the pan. Cook for 3-4 minutes. 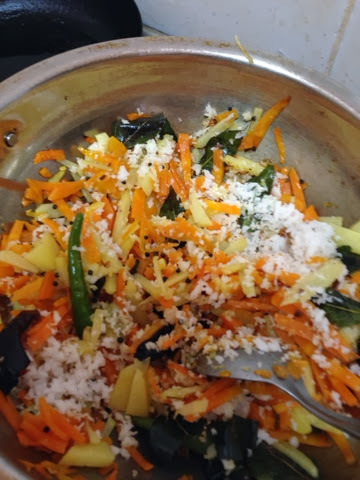 Open the lid and add scrapped coconut and garam masala powder. Stir fry for another few seconds. Note : Do not add water, it will cause to loose the crunchy texture of carrots and potatoes. Always keep in low flame and stir in between. Carrot and potato look so beautiful in the blue heart.